Recently, Sun Sounds of Arizona was honored at the International Association of Audio Information Services (IAAIS) Conference, in Jacksonville, Florida. The IAAIS believes everyone with a visual, physical, or learning disability has a right to equal access to all forms of information available to the general public. IAAIS works actively to promote and protect this access. 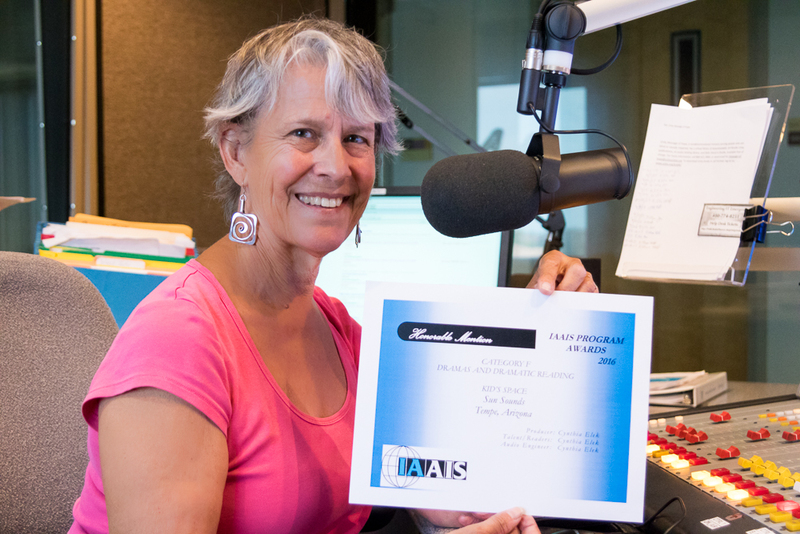 Sun Sounds of Arizona volunteer, Cynthia Elek, was recognized for her work in Drama and Dramatic reading. Cynthia Elek is a reader at the Sun Sounds of Arizona Tempe affiliate, and has a background in theater and music. She was recognized for Kids Space, a program that consists of children's books for a younger audience, which is produced and read weekly. She also produces and reads for the In Tune with Music program, which focuses on articles that pertain to opera, instrumental or vocal music. Thank you for your reading excellence Cynthia!